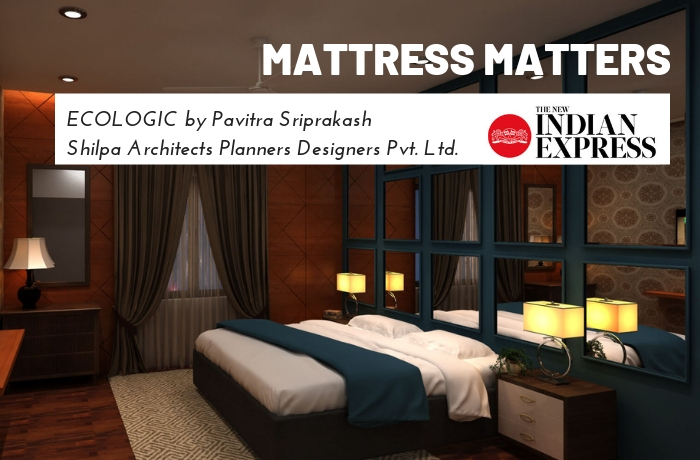 21-Dec-2018: Pavitra Sriprakash, Director and Chief Designer at Shilpa Architects Planners Designers writes a weekly column on Sustainability for The New Indian Express titled “ECOLOGIC”. This week she writes about responsibly recycling old mattresses when a new one is purchased..
A recent experience of ordering a new mattress for my father has made me mattress savvy- rather mattress recycling savvy. The tough decision to renew a mattress presents itself to pretty much every one of us – maybe not ever so often, but it does happen that the current one sinks, it doesn’t feel firm enough anymore, or it has become lumpy. For many reasons it is possible for one to feel the need to switch out their mattress – however what is difficult is the process of responsibly getting rid of them.. Most mattress suppliers can take back an older mattress. There is value in them and it is possible to strip them down and then reuse a decent part of it. However, this is seldom the case. The first thing to do is to check if the company delivering the mattress will take the old one – some may. If not, what happens next is the worst possible situation – a mattress gets thrown out of the home and becomes a part of the city landfill. Developed countries have councils that deal specifically with “Mattress Recycling”. The facts from one such agency The Mattress Recycling Council in America are indeed frightening – their country disposes roughly 15 to 20 million mattresses every year. If we were to do the math on how much space that actually takes up – it is about 25 container ship-loads every year going into dump yards. Given how bulky and complex a mattress is, it is a good idea to understand alternate means of disposal to encourage people that have one to dispose of. If the mattress is in decent condition, please do consider selling it for a fraction of the original price online. Sites like Olx and Quikr, can be used for this. If this also fails, consider ways to donate the mattress – to people that could be working in a household or to charities that deal with children, older people and even animals. If that fails as well, it is worthwhile to consider taking the mattress apart and reusing its parts. There is on average about 10 kgs of steel which can be taken out and sold for scrap. The foam can be used around the house to make smaller cushions, carpets, pet bedding etc. The wooden parts can be taken out and used for small carpentry items, firewood or even garden mulch. Coir and cotton, once taken out from within the mattress, become easier to dispose and can bio degrade or be used for temporary insulation solutions on rooftops or landfilled in your backyard. The durable fabric upholstery of an old mattress is ideal for making throwaway rugs for your foyer, garage, shed or utility room. A unique idea using mattress springs is to use it for Christmas decorations – look online for DIY videos to create metal wreath displays and tree ornaments! So, the next time you have this unique requirement of changing a mattress – think outside the box! Get a solution that is useful to someone else as the first option. If that fails, think of how to responsibly recycle it instead of slyly taking it to a dumpster on the street and abandoning it there.